Arduino Blog » Master your Arduino skills and get certified! Master your Arduino skills and get certified! 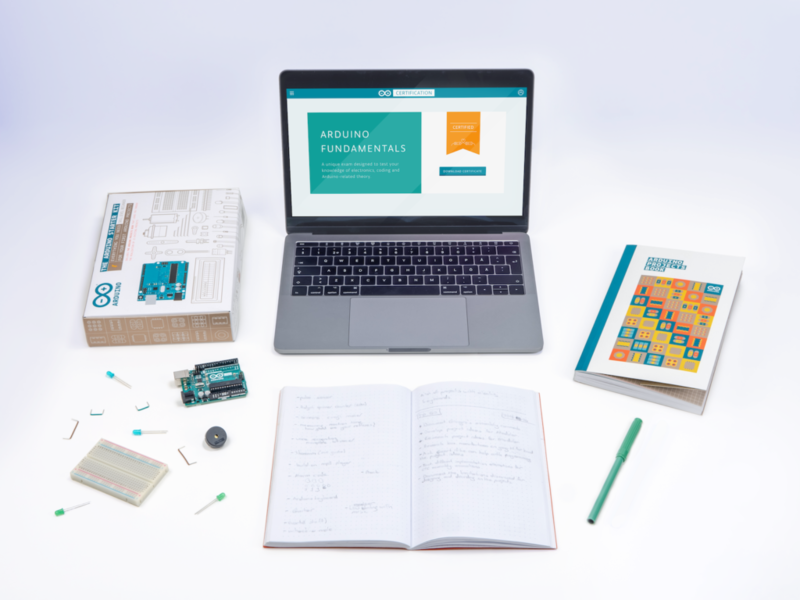 The Arduino Certification Program (ACP) is an Arduino initiative to officially certify Arduino users at different levels and evaluate their expertise in key Arduino knowledge areas. Certifications are offered at three tiers — enthusiasts, educators and professionals — which have been identified as the largest Arduino user groups through extensive feedback from the community. The first step, the Arduino Certification: Fundamentals Exam, is a structured way to enhance and validate your Arduino skills, and receive official recognition as you progress. Anyone interested in engaging with Arduino through a process that involves study, practice, and project building is encouraged to pursue this official certificate. 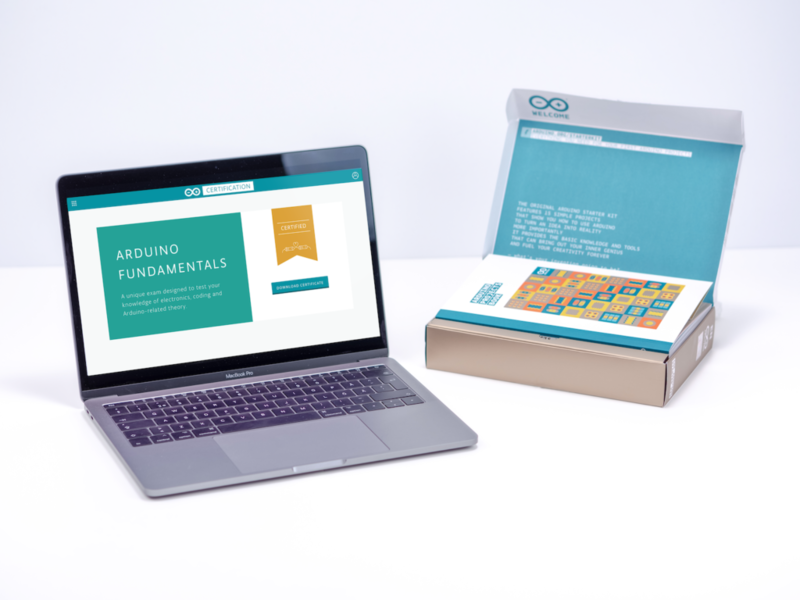 Developed in consultation with leading technology curriculum, interaction design, and electronic engineering professionals, the Arduino Certification: Fundamentals Exam assesses skills based on exercises consisting of practical tasks from the Arduino Starter Kit. During the exam, you will be asked to answer 36 questions of varied format and difficulty, which should take approximately 75 minutes to complete. Introduction to Arduino: Physical computing and Arduino, Arduino Uno, Arduino IDE and uploading, programming basics, electronics concepts, blink!, and the breadboard. Sensors and Actuator: Sensors, actuators, as well as digital and analog input/output. Input and Output Types: Using serial monitor, LEDs, motors, piezo as input/output, switches, variable resistors, IR, and PIR. 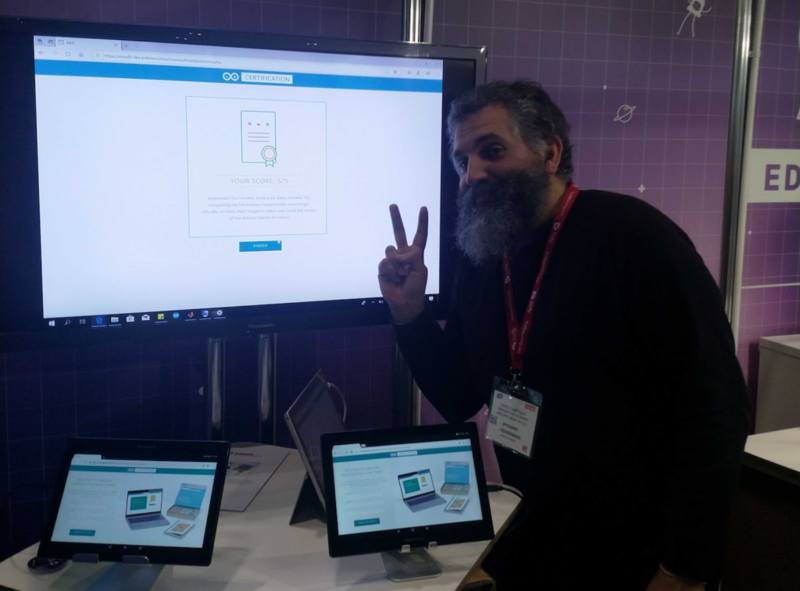 The Arduino Certification: Fundamentals Exam is currently on display at Bett 2019. Stop by stand C375 to see a demo for yourself and learn more about the program! is there a LINK to the program ? Would like to have more information on the certification. How much will the certificate be? Como será o procedimento para inscrição? Very keen to see links to apply. Very interested in this. How can I sign up? Very Good thing how can I sign up for Certification?? La Realidad me agradaria aplicar para estar en esta area y obtenerla seria cuestion que nos junten? o sacaran algun link para inscribirnos?? I really want to Master my Arduino skills and get certified. Since 2010 i use on my classes and final projects each year. Can say the link to inscribe? Will be exciting when this rolls out publicly! I am sure we will be informed when it does, but is there a projected timeline? Will the test be on-line (only)? If the certification is on-line how will you know if the person being certified is that person? Will there be any final-in-person (face-to-face) exam? Once you get certified -ok- then what? Next level…. ok and when you hit the ‘professional level’ then what? I understand that open-source stuff is all about sharing and “free” learning but…. what’s the catch? What is the practical side of getting certified at any level? I’ve been teaching Arduino officially in school in the past 5 years without any certificate. My sallary has not increased although I’ve had a lot of expenses through the years. Thank you in advance (anybody!) for any logical clarification on the matter…. I glad to get this certification. When will this program to get started? Thank you! Hello! Could you provide more information about the certification? How can I go on the stand C375 to see a demonstrations and learn more about the program? would you provide details please? Ola! Por favor, gostaria de informações gerais sobre essa certificação.